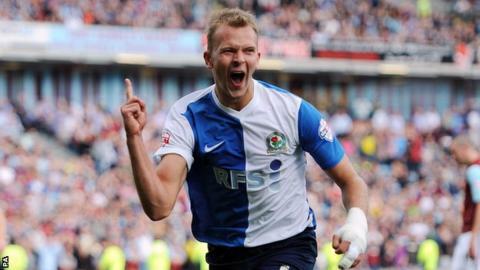 Blackburn Rovers striker Jordan Rhodes feared he had suffered a serious ankle injury while on international duty. The 23-year-old pulled out of the Scotland squad for their friendlies against USA and Norway after suffering the problem in a training session. and he could be fit enough to face Reading at Ewood Park on Saturday. "I thought at the time that I'd cracked a bone," Blackburn's record signing told BBC Radio Lancashire. "Luckily enough, the things afterwards have proved otherwise and hopefully I'm on the mend now." Rhodes, who has scored 10 goals in 16 Blackburn appearances so far this season, would not put a timescale on his return but it is hoped he will be available to Rovers boss Gary Bowyer at the weekend. Recalling the incident, he continued: "The ball was miles away and I was waiting for it to be crossed in. I peeled around the back of [Blackburn and Scotland team-mate] Grant Hanley and I went over on my ankle. A couple of steps afterwards, I really started to feel the pain. "Injuries are part and parcel of football and life. It's not the first and it won't be the last. You just continue to do the best you can. "I'll try and live my life the best I can from now until I get fit, and I'll try and get myself out on the field as soon as possible."